I am pleased to announced that “I can hear you now” will be part of ‘I am Here – Here I am’ art-event at The Studio! I am waiting you in Essex!!! 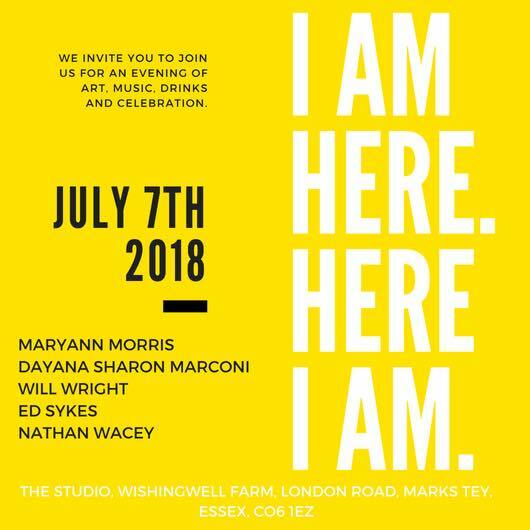 “I am Here – Here I am” art-event has been created in collaboration with the photographer Maryann Morris and will take place on July 7th 2018 in Essex, UK. It will be a celebratory exhibition of transformative works from emerging artists, tackling issues of identity, culture and perception: it will be a dynamic, engaging and participatory event. Rather than organising a classic white box Gallery exhibition, we decided to create a show orchestrated to further represent not only the subject matters of our works, but also our vision. Alongside the exhibition of our two projects, the show will include a separate area to present the work of the filmmaker Will Wright and it will also involve music projects by other two artists: Ed Sykes and Nathan Wacey, since we decided to create an art-collective that will allow us to engage a continuing collaboration in time. Opening | Event duration – Saturday, July 7th 2018, 5pm‐ 1am. The Studio – Wishingwell Farm, London Road, Marks Tey, Essex, CO6 1EZ.